I'm just shopping for power supplies and discovered recent spec PSU's are discontinuing providing -5V via the main board power header. I've sent an email question to Asus product support, but does anyone know if the Asus A8V Deluxe board requires -5V to operate properly (probably the same as the standard A8V)? Last edited by TrevorS; 2nd December, 2006 at 12:23 AM. OK, OK, I admit that I don't know the answer to this question. But at least five of our Members do, little help here, please! I have know Idea what you mean ?(-5v)? and I own an Asus A8v e-deluxe. Please explain -5v Im interested in maximizing my board and Im looking for an upgrade from the 939 venice single core chip? 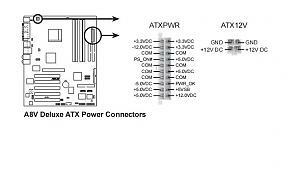 Power Supplies used to provide +12v, +5v and +3.3v, as well as -12v and -5v. Up to date PSU's don't provide -5v. The Asus A8V mainboard is old enough that it might require -5v. Thus TrevorS's question, that I wish someone would answer! Thanks Cloasters -- appreciate your help! It seems the board was developed around the same time the PS spec (apparently 1.3) dropped the -5V. So I guess it's basically a 50/50 shot. 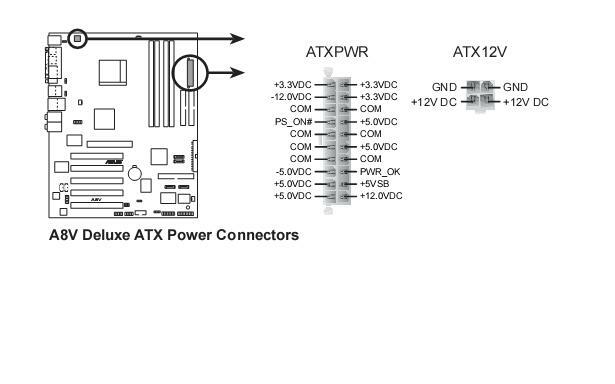 Since I haven't come across anything definite (including from Asus), I've crossed my fingers and placed an order for the necessary 24->20pin ATX adapter (didn't find it locally). With luck, the Christmas season won't slow it up too much and when it shows the board'll work. If not, the new PS will just have to go back and I'll have to find something else. It's a nice PS for the price though, so I'm definitely hoping this works out. If it does, I've another one standing by to go in a second A8V Deluxe box. Odds are pretty good that the board doesn't require -5v. The PS spec dropped -5 because so many boards were no longer using it that it no longer made sense to be providing it, or at least that is my understanding. Last edited by Gizmo; 5th December, 2006 at 09:26 PM. Last edited by Samuknow; 5th December, 2006 at 10:01 PM. I looked at the manual and saw it identifies the standard -5V pin position, but it wasn't clear to me whether that's for labeling purposes (the standard cut and paste), or a reflection of actual need. Part of the reason I say that is that the guy/gal who prepares the manual isn't necessarily fully savvy on the needs of the board (likewise the exact functioning of BIOS switches etc.). No question, it would have been nice if that identifier had been deliberately left out . I could well be caught on this, though it appears they are using the same VIA chipset on the next generation of the A8V board (nope, it's the K8T890 with support for PCIexpress.) The ATX power adapters shipped Monday by USPS and so I'll hopefully have them by Friday and will find out shortly thereafter. By the way, if anybody is interested in finding miscellaneous PC bits and pieces at attractive prices, OutletPC.com seems pretty good. I was just looking for the 24->20pin ATX adapters, but ended up ordering three other items as well -- all quantity of two each. Guess I'll find out for sure when the parts arrive. FWIW -- The relatively new A8V-E Deluxe board (K8T890) also identifies the -5V pin (pg 49). I suspect that image is just a standing drop-in from the techwriter image library. Here's hoping anyway. Last edited by TrevorS; 6th December, 2006 at 02:36 AM. That could very well be the case. Short of contacting tech support at Asus, good luck with that if you do, I am not sure how you could know. I just bought a brand new supply, made early 06, and put it on my NF2 Ultra DFI board and no problems. It does show the -5 volts available in the manual. I actually sent an information request into Asus (they have an online form), but no way of knowing how long it will take to hear from them. It appears Antec has chosen to delete -5V from their supplies, though other manufacturers appear to be keeping it, no doubt to ensure backwards compatibility. There has to be some cost savings to Antec and I get the impression they are under a lot of competitive pressure these days -- and it only increases. Last edited by TrevorS; 6th December, 2006 at 08:38 AM. If so, stay away from Antec. Not as good as they used to be, as you see. No -- that was three odd years ago I bought that 400, before I was clued into the fact that modern boards regulate the +12V down to the required CPU voltages. I didn't even evaluate it, simply expected it to be an upgrade from the SL350 -- I've learned since then. Don't know what happened to Antec. I guess their cost structure and agility fell behind the ever-growing competition. I'm currently banking on their TruePower Trio 650 and hoping it won't fall through (the -5V question) -- if it does, I'll probably move on to ThermalTake or something similar. It's sad Antec appears to have fallen, the competitive world is pretty tough these days. Last edited by TrevorS; 8th December, 2006 at 09:10 PM. Result is the Asus A8V Deluxe board appears to be perfectly happy without a -5V rail from the PSU. (Still no response from Asus.) I would expect the same to be true for the standard A8V board as well. I am glad that it worked. I learned a little something.